This set of 4 will complete an entire bed (4 corners). 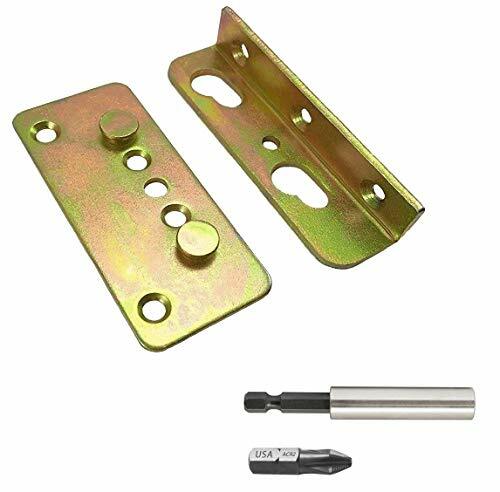 Premium heavy duty fasteners for joining 2 pieces of wood together. Ideal for bed frames, headboards, footboards, wooden furniture and DIY projects. Accommodates #6, #8 and #9 sized screws. 2 right brackets, 2 left brackets and 4 plates. Save time with easy mounting - no mortise necessary. All of our brackets are hand inspected before each shipment. ✔ 100% SAFE PURCHASE: We have absolute faith in our brackets. After all, we use them ourselves! If, however, you find them less than satisfactory, we got you covered. All of our hardware is covered by a LIFETIME guarantee, no questions asked! If you have any questions about this product by SuperiorTekk, contact us by completing and submitting the form below. If you are looking for a specif part number, please include it with your message.